Andy, How would we interpret the face cards in the Lenormand? Sometimes older, highly intelligent, but aloof female, and can be used as a stepmother, if the relationship is cool or frosty. She has the habit of being the “other woman”, or an estranged or ex-partner when the separation was not easy. Not normally bad, however, unless after the Fox. With the Clouds a couple. A difficult man you cannot ever really make out. Has an almost bipolar personality, exaggerated niceness or animosity. Card of the ex-partner (if a bad breakup, or one where you don’t see each other a lot), but can also be anyone you had an acrimonious connection with: stepfather, father, and colleague. Couple with the Snake. A younger person, often, but not always, male who is a very blunt speaker, eager, and occasionally prone to mood swings. Can be a teenager or sometimes a hyperactive and/or athletic person. She’s normally the same age as the querent, and is often a friend, a sister, or good and friendly work colleague. The Storks would be an estranged or ex-partner, when the parting was friendly and mutual. This is often a male who is either older, or wiser, than the client having the reading. It can be a father, older sibling, stepfather, or occasionally a patron/sponsor (rather than a boss). Can also be a friendly ex – partner, someone you still like and see. Normally someone around the same age as the client, who is friendly, warm, and attractive: it tends to describe someone of the opposite gender of the client. Blonde or light brown hair. This is a woman who can be roughly the same age, but frequently is older. She’s a friendly and warm female; this would be querent’s mother, aunt or, stepmother or mother-in-law if the relationship is good. She’s typically someone who is charming. Frequently, this is a man who is either older than the querent, OR it can be a male lover and therefore any age. If it’s not a lover, it does tend to be someone older. It’s someone you go to for advice, makes you feel safe and protected. A father, grandfather, or an uncle. This is the most used Knave, and is simply a child or younger person (below 18) in the person’s life. This is a woman who is younger, or the same age as the client. She is someone with some uncertainty around her, so for a man it can be on/off girlfriend, or, for a woman a love rival. Often this is the client’s boss, business partner, or an important male colleague, where there is a good relationship. They are normally the same age as the client, but can be a sibling who is younger. This is an aggressive and hurtful person, often a bully, who is the same age or a little younger than the client. A couple, like grandparents, aunts and uncles, sisters, and rarely twins. Often, but not always, older than the querent. A mature, strong, nurturing woman. Often a mother, grandmother, or aunt; someone that holds a matriarch position in the client’s life. A mature, aloof and influential man who can be egotistical and cold. A patriarch figure, a father, grandfather, uncle in the client’s life. A person in the client’s life, normally but not always male, who is an obstacle or enemy. A young or youthful looking man, very handsome and well dressed. With the Lilies and/or Heart can be a new lover or love interest. A man of any age, who is warm, friendly, and kind. A friend. Can also be a lover or the husband. 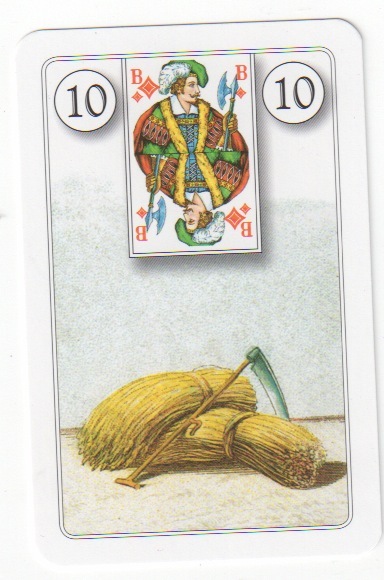 There are only 12 face cards in the Lenormand – Jack, Queen, King – just as you would find in a playing card deck. So which ‘type’ is missing? Does the Jack equate to the Tarot’s Knight and thus the Pages are missing? Probably the knight is the one that is not represented in Lenormand; the system follows the French suit pattern, and they dropped the knights for a queen in the fifteenth century. The Lenormand’s knaves are not universally, or even continuously, used as people; they are androgynous in interpretation, much like the continental “valets” in tarot. However the comparison is loose due to the absence of the same structure seen in tarot, or regular playing card, fortune telling. Apart from the Child we do not use the Rod, Scythe, and Heart that much as people; this could be due to the usage of several non-face cards as people i.e. Cavalier, the Birds, the Bear, Dog, the High Tower, and Mountain. Do the Face cards equate to the remaining Tarot card personalities? If not, what are those 12 personality types, as you would interpret them, Andy? No, there is no real similarity. Tarot, and most other playing card systems, has faces that are arraigned through suits and rank. The Lenormand, if stacked in suits, is clearly not randomly divided (look at the clubs), but we do not find the collective qualities needed for suit division evident in tarot, or piquet et cetera. Lenormand faces are interpreted through the traits of their main meaning, not the suit. In the way I teach Lenormand, I get students to compile keyword meanings for each card that correspond nouns and adjectives. For the kings and queens, you do the same giving one or two nouns and adjectives that could describe a person i.e. king of spades would be lover, protector, and, attractive, wise. Another good example, is the Queen of Clubs (7 – Snake) very often appears as a woman who wears glasses. This is nothing to do with the suit of clubs, but the fact that snakes have poor eyesight. Our pool for characteristics is literally in what that card represents, normally, turned into characteristics. Full interpretation is however made by combinations formed by any card touching (horizontally; vertically; diagonally) the face card. So, if the Queen of Clubs (Snake) had the Ship and Coffin either side of her, she could be a mature woman with dark hair, green eyes (Snake), olive skin or from abroad (Ship), and be musical or unwell (Coffin). Apart from the Child, it is not that common for readers to frequently use the knaves for people. However, the same rules apply: a Scythe (knave of diamonds) is a hurtful, spiteful, bully and a Rod (knave of clubs) is a blunt, talkative and hyper person. There are also several cards that are Lenormand people: the Cavalier, the Birds, the Bear, Dog, the High Tower, and Mountain. In Germany they tend to see the Bear as an official male, but in most Lenormand ‘schools’ she is a nurturing mother figure, the Mountain is a foreigner or an enemy, again drawing from the symbolism. I learnt to read palms through my maternal Romany family, and I’m now a professional palmist and cartomante; I also studied classical astrology extensively (horary and personal horoscopes). I authored the Cartomantes’ Cabinet: Lenormand Course, which was well received and have the second edition due out 1st October. I have one coming on fortune telling with tarot in Jan 2013. Still working on all the relationships among Lenormand cards. Lots of attributions, really, considering the simplicity of the actual symbols. Thanks, Ali, for setting this up. Both Helen in the last post and Andy here are great resources for the Lenormand traditions. This is an excellent resource. Andybc is a wonderful fount of knowledge and so generous with it! Thank you to Alison and Andybc for all your work.